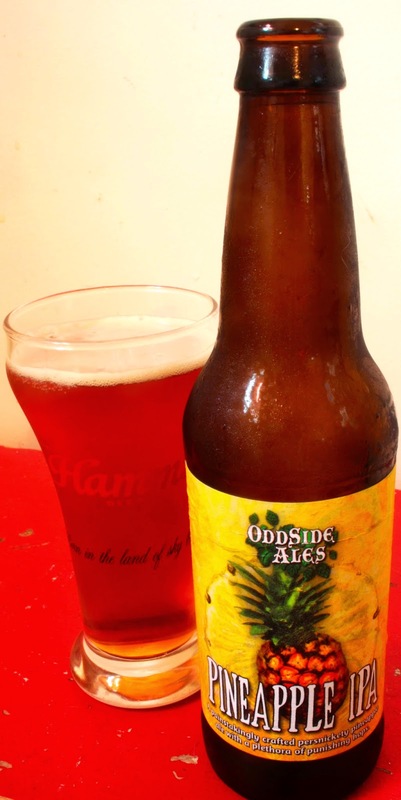 Odd Side's Pineapple IPA pours a rich and luminous amber in color with a minimal head that melts fairly quickly. The pineapple comes out even before the nose is near the glass. Not not overbearing and is not unlike the smell when I slice up a fresh one on a summer morning. Giving it a more investigative whiff aromas of orange peel and caramel notes of the malt sit on top of a piney hop character. As I sit here and write this it is one of the warmest days of the year here. I also just so happens, even though most people write it all off after Labor Day, that summer ends and fall starts in two days. Seems a good time as any to compile my notes on the last strays of these two I have had on the stash for later shelf in my fridge. A mix of tropical fruits such as tangerine, papaya and mango come into play first in the flavor along with the pineapple which though, based off the the scent, is not as dominant as expected at first. That is followed by some toasty grains and slightly sweet malts. A hop bitterness finds itself getting comfy with some refreshing fruit juices in the finish. As the beer breathes and adjusts to room temperature the pineapple seems to step up it's roll as the star of the show but still doesn't hop the limelight. Due to a bit of stickiness I don't know if I would have classified this as a beach beer but, then again, the weather kinda jacked most beach days this past summer. Either way I enjoyed my share of them for the season and it worked well while out in my backyard today while doing some end of the summer work and surveying the things I gotta do before the snow starts to fly. 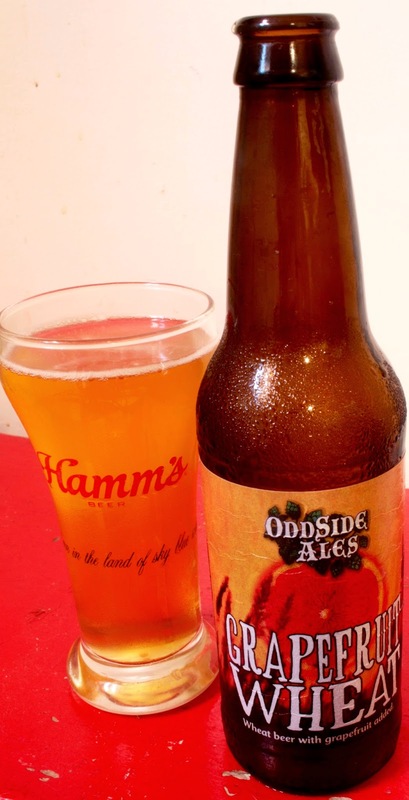 Though I have been a serious IPA head for many years and plenty of times over the last year it seemed that I have gotten a little jaded on the style. I like them getting ridiculous but there's been a few where I'm like "Calm down dude" in more recent times. This is a cool twist on the style though. It's different and in no way doing it over the top just for the sake of doing so. Looking forward to having some more of these when they come around again next summer. 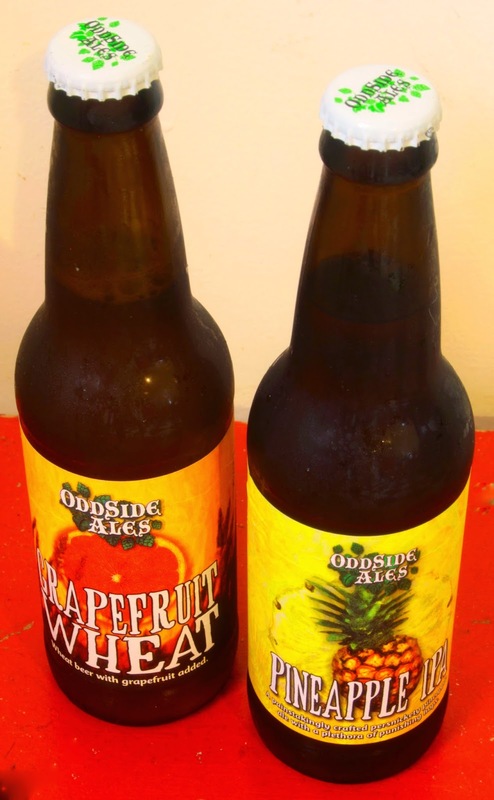 Slightly cloudy and gold in color Odd Side's Grapefruit Wheat produces a small foam cap as a head which slowly melts away. The smell of grapefruit is very faint on the nose but the bready and banana like characteristics that come with along for the ride when it usually comes to wheat beers is there. Giving it a little time to breathe some fruit scents come out but it seems to me more along the lines of white grapes along with a dint of earthy raw honey. The taste is dominant of that of a standard wheat beer. Light and easy summer drinking in that respect. The grapefruit flavor comes out much, much more in the flavor than it does in the smell but also leans more towards the rind of it than the juice. The finish has an odd sticky bitterness that doesn't seem to work right to these taste buds though..
Everything I've tried by Odd Side I have enjoyed immensely but there is something missing. Not saying it struck out when it went up to bat but never got past 2nd base for me either. Worth giving a shot if somebody offers one but no worries passing on investing 10+ bucks on a six pack of it.